As a young black woman working on Capitol Hill, Rhonda Foxx ? the chief of staff for Rep. Alma Adams of North Carolina ? rarely is recognized as a boss. Few, it seems, are expecting someone who looks like her. ?I just know there?s an -ism here. Is it ageism, sexism, racism? I?ve been called scheduler quite often,? Foxx said, referencing one of the entry-level positions in congressional offices. ?You?re not perceived as being that person or being in these roles. For me to come to work every day and feel there are glass ceilings within the people?s house, that creates some fire.? 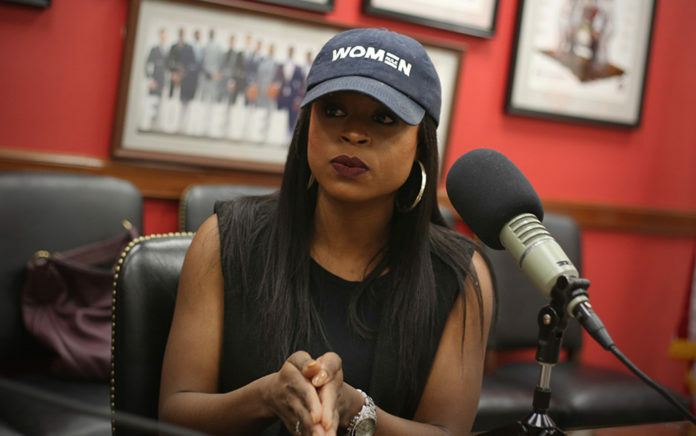 Foxx, 35, has turned that fire into action, creating the Black Women?s Congressional Alliance along with Meaghan Lynch, the communications director for Rep. G.K. Butterfield of North Carolina, to help promote and mentor women of color on the Hill. The numbers indicate her group has a lot of work ahead as Foxx is one of the few black women to hold senior staff positions on the Hill. In 2015, African-Americans accounted for less than 1 percent of top Senate staffers, according to a report by the Joint Center for Political and Economic Studies. Just 7.1 percent of top Senate staffers were people of color. Last year, Democrats in the House and Senate instituted the ?Rooney Rule,? an NFL requirement that minority candidates be interviewed as part of the hiring process. Last week, Senate Democrats released the results of a survey on diversity in their offices as of June 30 ? and there was not dramatic improvement. Five committees included no black people among Democratic staff members, including agriculture, armed services, Indian affairs, rules and veterans affairs. The agriculture committee staff, on the Democratic side, did not include anyone who identifies as non-white. Four Democratic senators? offices included no black staffers, and the black staffers who are employed are concentrated in lower-level positions. Of the top 147 positions in Senate Democratic offices, only three are held by black staffers (all men) ? Alabama Sen. Doug Jones? chief of staff and legislative directors for Sens. Dianne Feinstein and Kamala Harris of California ? according to the Joint Center for Political and Economic Studies. ?We?ve seen a little bit of progress, but I don?t think we?ve seen enough. I think we have a long way to go,? said Don Bell, director of the center?s Black Talent Initiative. ?We need senior staffers and we need members of Congress to take diversity and inclusion seriously, and I don?t think that?s happened yet.? Senate Republicans did not conduct a similar survey. Jennifer DeCasper is the only black woman to serve as chief of staff in the Senate. She works for Sen. Tim Scott of South Carolina, the only black Republican senator. Courtney Temple works as legislative director for Sen. Thom Tillis of North Carolina. ?In 2018, we can?t be debating: Has there been one or two?? Foxx said. ?It?s kind of unacceptable in 2018,? Lynch said. Similar numbers are not available for the House, but Foxx estimated there are fewer than 20 black women chiefs of staff in the House with most of them working for lawmakers who belong to the Congressional Black Caucus. According to Census data, 13.7 percent of the U.S. population identifies as black or African-American. Out of 535 members of Congress at the beginning of 2018, 50 were black (or 9.3 percent), according to Pew. Overall there were 104 black, Hispanic, Asian or Native American members (19.4 percent) of Congress. Those groups represent 39 percent of the U.S. population. In January, after black women were credited with propelling Jones to a surprise victory in a special election, Lynch, Foxx and three other women were getting coffee. They spotted another black woman who appeared to be a staffer and, given the paucity of staffers, were surprised they did not know her. ?How can we support one another? How can we not only just lift up each other, but help each other be more prepared to advance on the Hill? People of color and especially women of color, you don?t see us advancing to the level you see from other genders and races,? Lynch said. They sent an informal e-mail, asking black women to sign up if they wanted to be part of their informal group. A few days later, more than 200 people had signed up. The women stopped the leaders of the group in the hallways, asking what, if anything, they were going to do with the information. They organized a gathering and about 170 women showed up. They knew they had something and began hosting monthly events, centered on professional development since many of the staffers are interns, legislative coordinators and press assistants. Last week, as a celebration of six months, they hosted daily events, including naming their first set of ?Rising Stars,? a group of nine women of color that are prepared for senior staff roles. Foxx said one of her goals is to have a black woman chief of staff in a Democratic Senate office by 2020. ?It was just time. It is the year of the woman, the black woman,? Lynch said. ?We need diverse outlooks on the Hill. When we?re hearing from constituents, taking meetings, preparing floor remarks. I?m so passionate and excited that other people are excited and passionate. It?s been a great project to work on.? The nonpartisan Black Women?s Congressional Alliance is not the only group working to diversify congressional staffs. Republican Study Committee Chairman Rep. Mark Walker, who represents Greensboro, and Adams, who represents Charlotte, have teamed up on an internship program, now in its third year, to hire interns from historically black colleges and universities. In April, a former participant in the program landed a full-time job in Rep. Gregory Meeks? office. Temple is involved in the Congressional Black Republican Staff Association, which has about 50 members. She worked in the House for six years before joining the U.S. Travel Association as its first and only Republican lobbyist, she said. She joined Tillis? staff shortly after he took office in 2015, working her way from legislative assistant for immigration to senior legislative assistant to legislative director in 2017. ?There are members out there that understand the demographics of their states or districts isn?t just one demographic, and it?s important to have people on staff that can offer insight into these different communities,? Temple said. ?Organizations like the BWCA and also the Congressional Republican Staff Association are good organizations to have because it?s important to hire the right people. It also pushes members and folks to go out and make sure you?re also hiring and have a well-rounded diverse staff.? The goal for Foxx and Lynch is for others to follow Temple?s path ? moving up in congressional offices to have a seat at the table when policy is being discussed. ?We?re not going to have inclusive policies if we don?t have inclusive thought thinkers and we?re continually left out of the discussion. A lot of that deals with who is drafting the policy,? Foxx said.